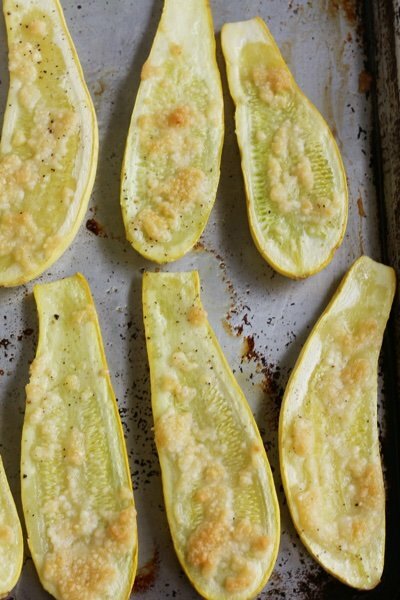 Summer squash, unlike winter squash, doesn’t have to be peeled. It arrives ready to go (which is my type of squash). In my experience the good stuff only shows up in the spring and summer. I found this lovely yellow squash for $1.49 per pound at my local supermarket and it was sweet. Since I roast all my vegetables, I decided to try roasting summer squash and the results are delicious. I riffed off a Martha Stewart recipe where she soaks the squash in a gallon of olive oil and ½ pound of cheese (not really). Honestly, if you use tons of olive oil and cheese you can make almost anything taste yummy. My battle is to figure out how much you need without drowning the food. This recipe uses 2 tablespoons of olive oil and ¼ cup of grated Parmesan and it works. The sweetness of the squash is a great complement to the saltiness of the cheese. Go ahead and eat the peel and the seeds – they are both delicious! Try it as a side to replace heavier potatoes or bread. Heat oven to 400 F. Slice squash lengthwise and place on a rimmed baking sheet. Mix olive oil and Parmesan in a small bowl. Using a small spoon spread a dollop of the mixture onto the flat surface of the squash. Roast for 25-30 minutes until cheese is slightly brown. Enjoy hot, cold, or room temperature. Looks yummy! I am also a big fan of roasting vegetables. Thank you for the recipe and alternatives to stodgy sides! 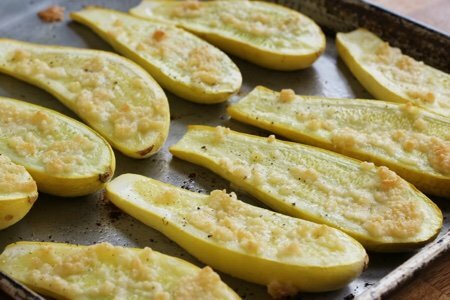 Love your take on the zucchini boats. I love Mexican almost anything, and this looks yummy without a lot of calories. Keep up the good work and thanks. I actually enjoy the skin left on my winter squash: butternut, acorn, etc. Basically anything except spaghetti squash, I roast skin-on and eat the whole thing. It's delicious.